The startling news broke, as it so often does these days, on Twitter. Muneer Karcher-Ramos, director of the Saint Paul Promise Neighborhood, glanced at his Twitter traffic from a Capitol reporter on a Sunday afternoon and discovered that language funding local education partnerships, a project he and others had been toiling on for months, had been inserted into a conference committee agreement. 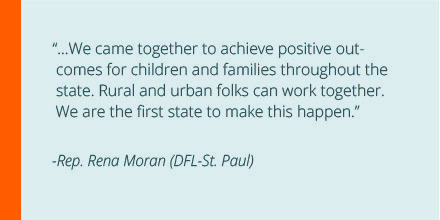 And just like that, an underdog proposal by a brand new and unusual urban-rural coalition was alive and funded by a special session of the Minnesota Legislature. This is a story about how Karcher-Ramos’ Saint Paul Promise Neighborhood, the Northside Achievement Zone in Minneapolis and three StriveTogether Cradle to Career Network partnerships from Greater Minnesota (outside the Twin Cities), with help from a few friends and some supportive legislators, scored a major legislative breakthrough for the students across the state. The Minnesota Legislature and the governor have agreed to provide nearly $6 million over the next two years for operation and pilot funding for the partnerships, making Minnesota the first state to make such an investment in these unique community groups. It is a story about collaboration, working the grassroots and the grasstops, working across organizational, political, geographic and social boundaries, keeping common goals top of mind and never giving up. In its telling are some important lessons for other similar efforts in Minnesota and perhaps across the country. It all started a year earlier when Karcher-Ramos and Sondra Samuels, president and CEO of the Northside Achievement Zone, got together to talk about ways to build their partnership. At the same time, Growth and Justice, a Minnesota policy advocacy group focused on reducing inequality and building a more inclusive prosperity, had been helping coordinate communications between five StriveTogether groups from Greater Minnesota. Dane Smith, the president of the organization and a veteran political reporter turned public policy advocate, is passionate about the potential for Promise Neighborhoods and the StriveTogether collective impact model. 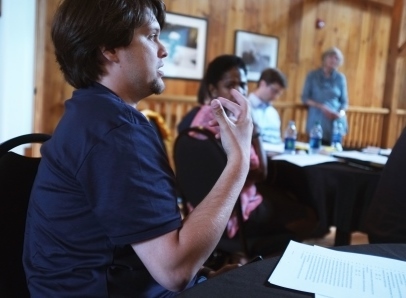 Conversations between the groups began happening in the summer of 2014, creating a growing realization that the urban groups and the StriveTogether groups from rural areas outside the metropolitan area had a lot in common, particularly the way they focused on mobilization of resources from the community to support students from birth to career. A political factor also came into play. The Minnesota House, with the election of a dozen Republican legislators from Greater Minnesota, turned from Democratic-Farmer-Labor Party (DFL) to Republican, owing almost entirely to flips in Greater Minnesota legislative districts. If the coalition was going to succeed, it had to cross both geographic and political boundaries and provide reasons for both parties to support it, the groups reasoned. The data-driven, community-based nature of the groups would appeal to the newly elected Republican majority, Smith surmised. In downtown Minneapolis at a November meeting and conference call, facilitated by Growth & Justice Policy & Research Director Maureen Ramirez and by veteran lobbyist Nancy Hylden, the partners acquainted themselves with each other and kicked around the idea of a coalition to seek state funding. They agreed to keep thinking and working together and agreed to meet again. Muneer Karcher-Ramos with St. Paul Promise Neighborhood speaks with partners. The partnership was formed: Northside Achievement Zone from Minneapolis; Saint Paul Promise Neighborhood; Every Hand Joined from Red Wing; Northfield Promise; Partner for Student Success from St. Cloud; Growth & Justice; and Wilder Foundation from St. Paul. In all, the groups serve more than 43,000 youth. Now the hard work began: convincing the Legislature and the governor that these disparate groups from all around the state had a workable, data-driven, organized plan to attack Minnesota’s student opportunity and achievement gaps. They divided up into teams: advocacy/lobbying at the Capitol; community engagement with parents and others at the Capitol; technical working on the language of the bill; grassroots and grasstops in individual communities and centers of influence and more. Growth & Justice helped organize testimony. The coalition checked in by conference call every week and emails flew back-and-forth daily and on weekends. Not only did parents show up at hearings and testify, they created unique ways to educate and thank legislators through artwork, huge cards and videos. One of those parents was Arviance Bryant of St. Paul, who has two children in the Promise Neighborhood programs. While Karcher-Ramos and Samuels worked with grass-roots groups and local legislators, the greater Minnesota partners continued to reach out to their local legislators like Kelly as well as their local community members. At the same time, Kate Mortenson, a Minneapolis philanthropist and advocate who is involved with NAZ and Saint Paul Promise, and Scott Jones, of Red Wing’s Jones Family Foundation and active with Every Hand Joined, worked the grasstops: political, business leaders and professional leaders, convincing them of the value of the partnership project. Bruce Watkins with Partner for Student Success speaks with partners. Jeff Edmondson of StriveTogether, Scott Jones of Jones Family Foundation; Dane Smith with Growth & Justice and Kate Mortenson look on. Mortenson viewed their roles as “catalyzers and accelerators,” making sure that community and state leaders understood the significance of the coalition for the state. They were able to get the heads of five Chambers of Commerce to write a supporting letter, saying the project was good for business, for example. But despite the lobbying, the grass-roots organizing, the grass-tops work and all the rest, the House education bill did not include increases for NAZ or Saint Paul Promise and no money for the three StriveTogether partnerships. The Senate bill only included existing NAZ and Saint Paul Promise. Karcher-Ramos got a call from Patrick Ness of the Wilder Foundation in the middle of a Saturday night in May telling him that no new money was included for any of the initiatives in the final compromise bill. As it turned out, Governor Mark Dayton, a DFLer, vetoed the education bill because it lacked the funding he wanted for universal pre-K programs. But his veto actually provided a reprieve for the proposal, in part because the governor had heard about it late in the session at a meeting at a St. Paul school. “We were in; we were out; we were out again and then we were in,” said Jones of Red Wing with a smile. And that’s when Karcher-Ramos saw the news on Twitter about the Education Partnership Fund finally making it out of a conference committee. The special session of the Legislature, after lots of wrangling over a host of other issues, passed the proposal and Gov. Dayton signed it. The bill contained line-item funding for the five urban and rural partnerships. The urban units will receive $1.2 million each for each of the next two years, and the Greater Minnesota partnerships will receive $167,000 apiece each year. He added that legislators believed the entire state would benefit from the collaboration. “If it’s working, it will get bi-partisan support,” Rep. Kelly said. Rep. Thissen, the DFL leader in the House, agreed that the Education Partnership Fund can continue to have backing from both parties. The coalition partners, while ecstatic about their successes, are busy planning next steps at the Legislature and also ways to achieve their common goals of kindergarten readiness, third-grade reading, high school graduation and college and career readiness. They are looking for ways to compare data and share successes. And they are thinking about how to expand to include other StriveTogether Cradle to Career Network members in greater Minnesota. With these new areas of focus, they now call themselves Education Parnterships Coalition. Back at her North Minneapolis office, Samuels conceded the group didn’t really know if the Legislature would come through. “But we are thrilled by the outcome and the real winners are the children of our state.” She noted that people from all over the country are watching what happens in Minnesota. The coalition partners, despite the long hours and the ups and downs of the legislative process, were obviously pleased with the results. But what did they take away from the process for the next time or for others in Minnesota or in other states and communities? What are the lessons learned? Recognize that everyone brings assets to the table. “Whether it was compelling testimony, critical relationships, policy expertise or parent organizing, all the organizations played a key role in the partnership,” Karcher-Ramos said. Organize the grassroots and the grasstops. “When both are in play, that is a really positive force for change,” said Charley Nelson, executive director of Every Hand Joined. Learn to work with legislators. “Find powerful allies within the political process who are the kind of people who won’t quit … people on both sides of the aisle who can be influential with their peers,” Jones said. Make sure legislators can see the outcome as a win-win situation. For greater Minnesota legislators there were two phrases that mattered a lot: locally control and data-driven. In addition, the track record of existing partnerships around the state using holding to a common set of core principals made a difference. Believe in what you are doing. “The odds are long, but the odds are long for the kids we’re trying to help,” Mortenson said.